We got the first volume of Treasury of Classic Tales in November last year. The series is (probably) going to collect all Sunday pages under the Treasury logo that ran in newspapers from 1952 and all the way up to 1986. We got a total of 129 stories in this series and by my calculation it’s enough to fill at least 9, maybe 10 books. But I guess sales will show if we are going to get all of them. 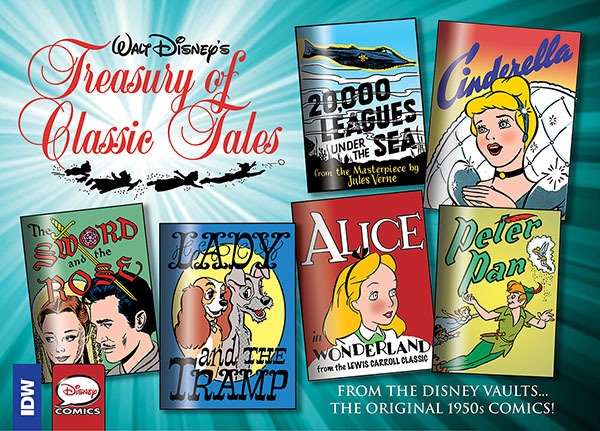 The first volume in this series collects the first 8 treasury stories in addition to a Cinderella adaptation and a Alice in Wonderland adaptation that were printed as standalone Sunday series between the Silly Symphony series and Treasury of Classic Tales. And all stories in this series are adaptations of animated or live-action features – sometimes an entire film and sometimes just a segment of it. "20,000 Leagues Under the Sea" - adaptation of the live-ation movie with the same name. When I got the first volume in this series I didn’t really know how to read the book… I have to admit I’m not that interested in all of the stories in this series – at least not just reading them as entertainment. A few years ago I had a project going on trying to watch old live-action Disney movies (still a lot I haven’t seen), so one way to read this book is to watch the movie first, and then read the story to compare. Another interesting way could be to compare the Sunday page adaptations to the regular comic book adaptations. There are several other series of Sunday pages I’d rather see collected in IDW’s Library of American Comics, like the Brer Rabbit Sundays, or the early years of post-Gottfredson Mickey Mouse Sundays. But I still think it’s a good thing that Treasury of Classic Tales is being collected too. Some of the stories in this series are really hard to find! Even in the newspapers at the time they were created they were a rare find. So it’s great that they finally become available for anyone interested, and I know a lot of Jack Kirby fans have been waiting a long time for a proper collection of the The Black Hole Sunday pages. But the volume collecting that story is still years away. As with the Silly Symphonies and Donald Duck Sundays collections from IDW, Treasury of Classic Tales also print the pages in the full format with coloring based on the original coloring used in the newspapers. But in the newspapers the pages were often printed in a different layout. 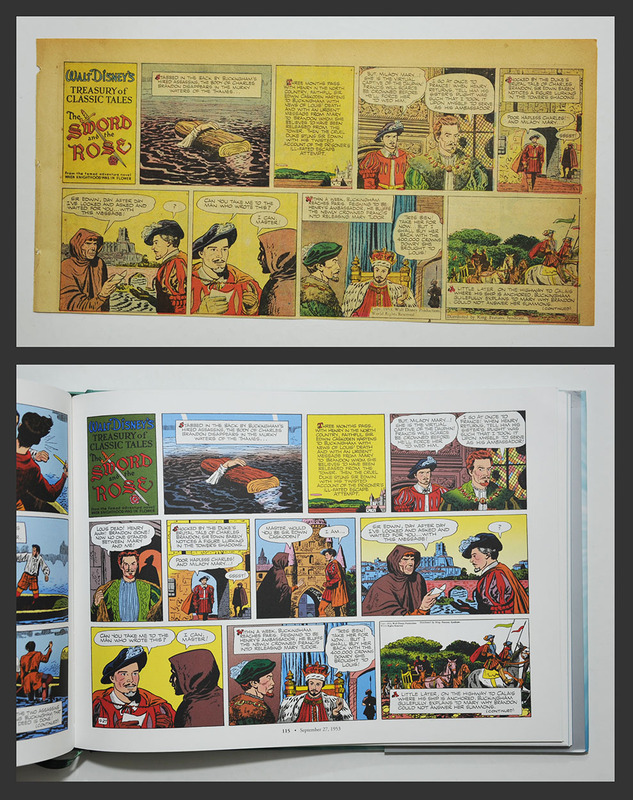 Under are some pages from The Sword and the Rose, comparing different layouts in the newspapers with the full format in the book. Sunday pages were usually colored unlike to the daily strips that at the time were printed in black and white. But some newspapers also printed the Sunday pages without color. In the next example the panes are arranged to fill an entire page in the newspaper. 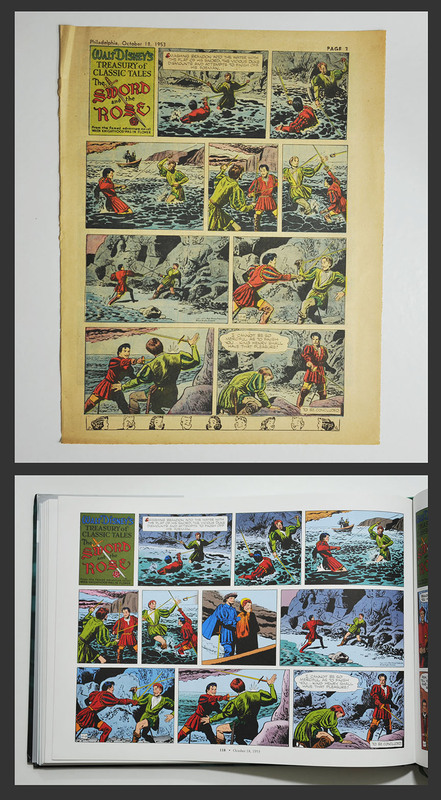 Note that two panels are cut too. Another popular format was to print the Sunday pages over two rows. That way the newspaper could fit 3 different comics on the same page. Two panels are cut in this example too, and other panels are also trimmed in width. I’ve always believed that the 3 row landscape format as used in the book was the original format containing all of the artwork. But this seems to not be the case. 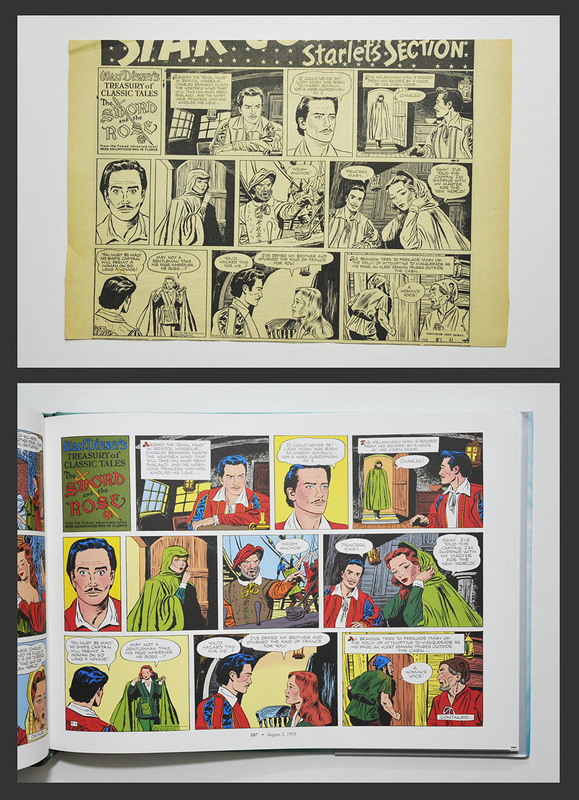 In the 2-row example above the panels actually have more art in the bottom and top compared to the panels in the book! So the original artwork must look like none of the examples above (?). Trying to search the web for original art, all examples I find looks like the layout found in the book, ex. the July 18, 1954 page from Peter and the Wolf. But my newspaper clipping got more art not present on that piece of original art. So was the extra art added later, or is the piece in the gallery at Comic Art Fans not really the original art, just one of the original mountings? If anyone knows more about this, please enlighten me!